Some have the impression that teeth are strong, but they can chip, crack or break easily if we get careless. Some of the most common causes are biting down, accident hits, or dental diseases like cavities. 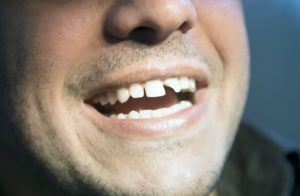 When a tooth chips there is a chance that it may not hurt so much at first. But you can tell with your tongue when touching the chipped tooth. In case your tooth hurts is because the nerve inside could be damaged in some way. The discomfort in the nerves is because the dentin is exposed. The first thing to know is that there is no other to treat a chipped tooth at home. You need to see a dentist as soon as possible to solve it. Even if the tooth looks fine, the pain will only get worse over time. Especially with hot and cold drinks and food. And let’s not even begging with the aesthetic part. A chipped tooth will only make you look like sloppy and ungly. A dentist is the only professional capable of providing you with a proper diagnosis and solutions for the tooth’s nerve in case is in danger. If the nerve is damaged then you will need a root canal treatment to solve the problem. Here at Dental Solutions you will find the bests dentists in Los Algodones to solve any problem with chipped teeth. As for treatment it is best to get a dental crown. There are many materials available but we suggest full porcelain because it looks really good and are durable. Other things to consider are dental veneers and fillings, but they will depend on the state of the tooth. Ask your dentist for the best course of action so you can get the best results. One thing you can do is to rinse your mouth with warm water and salt to clean the area and avoid infections. If you are bleeding, using a piece of gauze to apply good pressure can help to mitigate the hemorrhage. In case it doesn’t work a little tea bag can do amazing things to absorb the bleeding just fine. Using ice or a cold package to apply it to the cheek or lips over the broken tooth can help also to reduce swelling and relieve some of the pain. Remember to cover up the broken tooth, for this you can use a temporary dental cement to solve this issue. You can find this dental cement at a drugstore or pharmacy. If by any chance you are in town we recommend going to Los Algodones pharmacies because there you can find great deals and offers in any dental product that you may need. Ifyou need some dental cement or you every day toothbrush, you won’t find better prices than the pharmacies in Los Algodones. Another golden tip is to take over-the-counter pain killers. Ask your dentist or a doctor which one you can take and buy them. Don’t wait until the pain settles in and take them as soon as possible to get the most out of them. If you wait too long then the pain killers won’t as effect as you would like to get rid of the pain.